Traffic Report: Facebook Increases - Twitter Decreases, But Why Are We Comparing? Traffic Report: Facebook Increases – Twitter Decreases, But Why Are We Comparing? 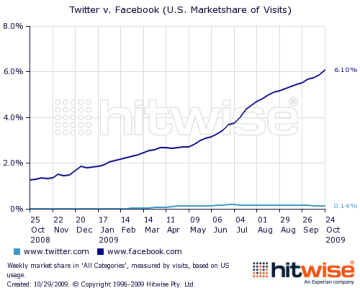 Here’s an amazing statistic from HitWise: Facebook.com makes up 6 percent of all U.S. Internet visits. That is really unimaginable when you think about how many websites are on the web, and all the different places that people could be browsing. But Why Are We Comparing Anyway? Now I’m excited as anyone that Facebook is increasing in traffic like it is. And I’m also not too thrilled that Twitter is decreasing in traffic. But I can’t help but wonder why we are even comparing these two sites in the first place? Twitter is not a social network. Twitter is a broadcast mechanism. You follow me, I broadcast messages to you. If you’re interested in staying on board and receiving my updates, then you stay. If you don’t like it, you leave (unfollow). Facebook is a social network. You become a Fan of my page. You request to be my friend, and I can chose (or not) to accept your request. And on my Facebook Fan Page, I can reply directly to your comments, and everyone else can easily follow our conversation. So really, I’m confused as to why we have this obsession over comparing the traffic data and analysis between Facebook and Twitter?